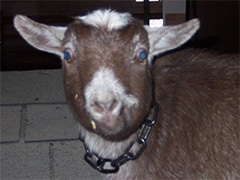 Pygmy Goats have good natured personalities & are alert, animated & gregarious animals. A pygmy goat is a small breed of domestic goat that originated in the Cameroon Valley of West Africa. They were imported into the US in the 1950’s for use in zoos & for research, but quickly became a popular pet. They have good natured personalities & are alert, animated & gregarious animals. When full grown females will weigh about 50 lbs. & males about 60lbs. They come in a range of colors. Our little Pygmy’s are Lizzie & Louie, a mother, son duo. Our neighbor raises these goats & thought we definitely needed a couple of them for our Livestock Barn because they are just so delightful with people! They were right! Liz & Lou are a big hit, coming over to see everyone & nibbling on their clothes. All our animals on the farm are here for a reason & serve a purpose. These guys’ job is comic relief & they are good at their job!!! Lizzie is 11 years old now & Louie is 9.